Welcome to the Comedy Bin, THE GREAT COMEDY MEET-UP ON FRIDAYS!!!!!! If you are looking for a fun night out with loads of hilarious stand-up comedians, then we can assure you, you have landed on the right planet. We bring to the stage a mix of totally new talent and established comedians testing the water with new material. Bouncing along proceedings are the experienced regular MCs who create a fun atmosphere where you'll laugh your socks off - you never know, they may even introduce you to (or be!) the next Superstar of Comedy. 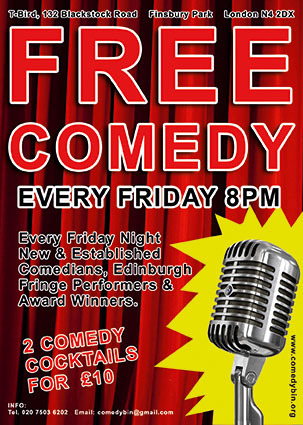 Every Friday Night New & Established Comedians, Edinburgh Fringe Performers & Award Winners. 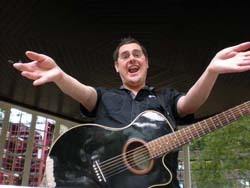 Gwilum is a musical comedian/MC and started doing stand up comedy in August 2007. Gwilum has a warm and confident on stage persona, which lends itself naturally to audience interaction, his act consists of guitar based songs, observations, strange impressions, quirky theories and one liners. "It’s always a pleasure to play the Comedy Bin gigs. Great rooms, friendly crowds and wonderful MCs. An excellent variety of venues around town, brilliant experience regardless what level you’re at. Play them all!" "Every Comedy bin spot I've done has been fantastic from the audience to the organisation of the night. I've done some pretty bad gigs in my time so a spot at a Comedy bin night reminds me why I do this thing called "comedy"!" "All manner of imaginative and diverse comedy can be found tucked away at venues across London in the Comedy Bin. Always a pleasure to perform at, with a fun atmosphere from both the other acts and audience members. I think of it as a Comedy Bread Bin, full of delicious loaves (laughs) that'll make you (bread) roll on the floor wetting (wheating) yourself (raising flour)..."
"The Comedy bin was an exciting night to be play. A welcoming friendly compere and warm atmosphere to peform in!" Acts need to have done at least 150 gigs for T-Bird unless you think you are really funny ==> send us a video of you doing stand-up. We have also spots for new acts. It's also possible to rock up anytime and ask the MCs for a spot if you haven't booked a spot. However, they will only be allowed on stage if there is enough time and priority will be given to acts that bring along guests. All gigs are to be treated as ‘real gigs’, i.e. no reading from the back of your hand or even worse reading from a laptop (which has happened in the past) etc. Acts are encouraged to bring guests and help flyering in order to get booking priority the following month. No-Shows: Whilst most of the acts do turn up, those who do not are taking the place of other acts who really want stage time but were not able to book a spot. As such, comics who do not turn up without notifying both us, and the MC beforehand (if possible a few days before the gig ) will not be able to book a spot the following two months. Your consideration is appreciated. running late, then please get in touch with your MC otherwise your spot might turn into an open spot for acts that rock up. invite your friends, spread the word etc.